St. Patrick Catholic School is a Christ-centered environment which promotes academic excellence, spiritual and social development, through effective instruction and the celebration of our faith. We see our students’ gifts as given by God and therefore take responsibility for returning them to God fully developed. 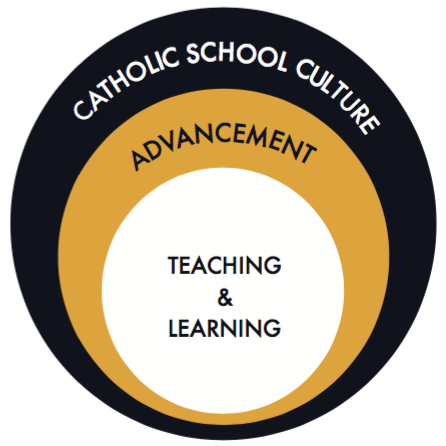 Because the intellectual growth of our students is a spiritual imperative, St. Patrick Catholic School implements best practices in teaching and learning that result in significant gains for students. St. Patrick Catholic School provides a Catholic education of the highest quality within a safe and nurturing environment. We seek to engage your children both intellectually and spiritually, putting them on the path to College and Heaven. Our school provides a challenging, faith-filled, educational experience that serves as the foundation for a life lived in service to Jesus, the Church and Community. As part of a nationwide network of high-performing Catholic schools, St. Patrick is a Notre Dame ACE Academy. The Notre Dame ACE Academy initiative is a university-school partnership that seeks to help St. Patrick flourish in three categories: Catholic School Culture, Advancement, and Teaching and Learning. By focusing on these three dimensions, our model promotes continuous improvement in all facets of school life for a safer, more welcoming, and higher-achieving environment. La iniciativa de la academia de ACE de Notre Dame es una asociación entre universidades y escuelas que ayudan a la Escuela Católica de San Patricio prosperar en tres categorías: la cultura de una escuela católica, progreso, y enseñanza y aprendizaje. Al enfocar en estas tres dimensiones, nuestro modelo promueve mejoramientos continuos de todas las facetas de la vida escolar para lograr un medioambiente más seguro, acogedor y exitoso. Throughout the year students are invited to grow in their personal relationship with God, serve others, learn about the Catholic faith, receive the sacraments and worship together. They participate in weekly Masses, prayer services, sacramental preparation, Advent, Lent and other celebrations of the Church Year. Students put their faith in action through Campus Ministry where they collaborate with teachers and priests to lead and participate in community outreach, service projects and retreats that unite and strengthen their class communities and provide creative opportunities to explore their spiritual relationship with God. A través de los años, nuestros estudiantes son invitados a crecer su relación personal con Dios, servir a otros, aprender sobre la fe católica, recibir los sacramentos y adorar juntos. Ellos participan en misa cada semana, servicios de oración, preparación de los sacramentos, Adviento, Cuaresma, y otras celebraciones durante el año eclesiástico. Estudiantes ponen su fe en acción a través del ministerio en campus donde colaboran con maestros y sacerdotes para guiar y participar en divulgación comunitaria, proyectos de servicio y retiros espirituales, las cuales unen y fortalecen sus comunidades escolares y proveen oportunidades creativas para explorar su relación espiritual con Dios. We employ a team of dedicated, enthusiastic, learned, kind, and moral educators. From Early Childhood to the eighth grade, the faculty is devoted to the well-being and success of every student. All members of the faculty hold Bachelor’s Degrees, and several hold Master’s Degrees. All full-time faculty members are certified in the State of Florida to teach in their assigned instructional areas. They have been trained in the most current educational trends, and have the experience to implement the best practices in the classroom. Empleamos un grupo de maestros dedicados, entusiasmados, eruditos, cariñosos y morales. Desde la infancia hasta el octavo grado, nuestra facultad están devotos al bienestar y el éxito de cada estudiante. Toda nuestra facultad ha obtenido su licenciatura y algunos han obtenidos su maestría. Miembros de la facultad que trabajan a tiempo completo tienen su certificación en el estado de la Florida en su área educativa asignada. Han sido calificados sobre las modas educacionales más modernas y tienen experiencia para implementar las mejores prácticas en el salón de clase. 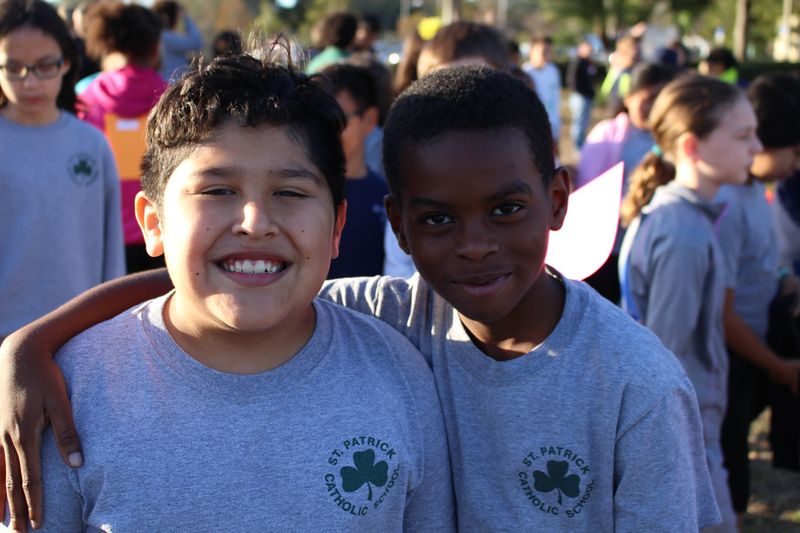 St. Patrick employs tried-and-true methods to not only increase enrollment, but strengthen our relationship with parents and the community to foster a sustainable environment for our families. This includes providing access to scholarships, proper management of public relations, and exceptional staff management. It is essential that we nurture and grow our school to better serve the Church and the world. La Escuela Católica de San Patricio usa métodos probados y verificados no solo para aumentar el número de inscripciones, pero también para mejorar las relaciones con los padres y la comunidad para fomentar un medioambiente sostenible para nuestras familias. Esto incluye suministrar acceso a becas, dirección apropiada de relaciones públicas, y gerencia excepcional del personal. Para nosotros es esencial criar y crecer nuestra escuela para poder mejor servir la iglesia y el mundo. St. Patrick provides a challenging, faith-filled, and educational experience that serves as the foundation for a life lived in service to Jesus, the Church, and Community. We are totally committed to the well-being and growth of your children. Our goals are College and Heaven! Not convinced? 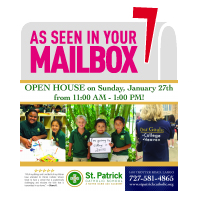 Check out what's going on around St. Patrick or contact us with any further questions. ¿Necesita más para convencerlo? Compruebe lo que está pasando en nuestra escuela o contáctenos con sus preguntas. "Every child is made in the image and likeness of God." This belief drives our efforts to ensure that as many children as possible receive a high quality Catholic education. We advance this mission by increasing access for under-served communities through parental choice scholarships. ACE will support nearly 4,000 students in 14 Notre Dame ACE Academies in the 2016-17 school year. 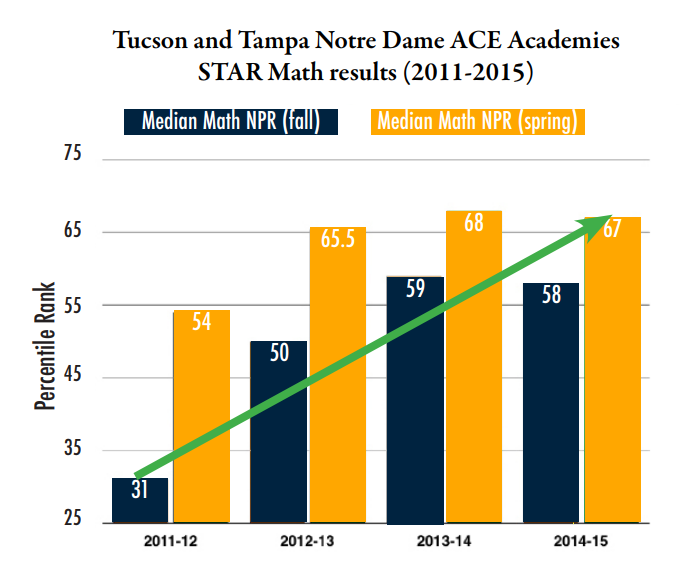 Notre Dame ACE Academies are closing the achievement gap. The median national percentile ranking (NPR) of our students increased from fall to spring every year, indicating students gained more than 1 year of growth. From fall 2011 to spring 2015, on average, our students improved from the bottom third to the top third in the nation in math. Reading scores are just as impressive with students moving from the 29th to the 53rd percentile. New students typically enter Notre Dame ACE Academies several grade levels behind (navy bars). Our culture of high expectations for academic growth and character formation quickly catch them up. 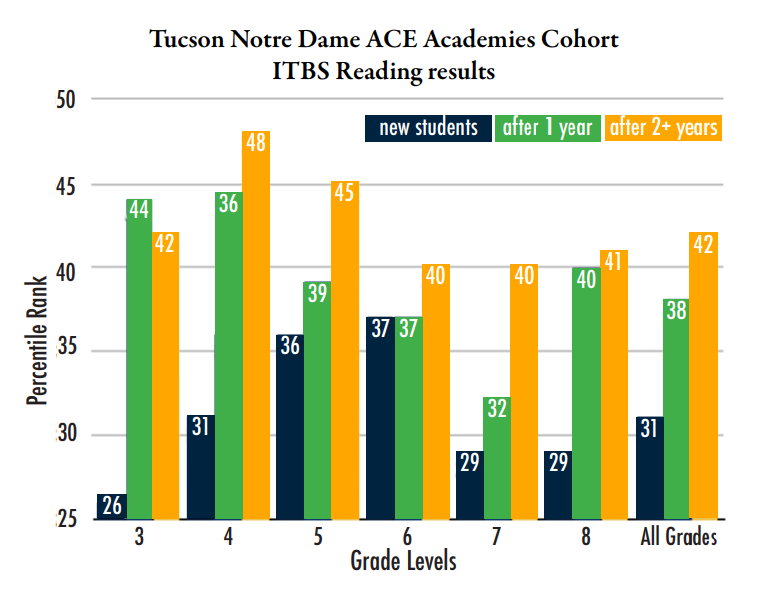 Even students who have only been in the ACE Academies for 1 year show dramatic academic gains, which they continue to demonstrate in subsequent years (green & gold bars). Math scores show similar results with students entering in the 33rd percentile and quickly moving up to the 42nd after just one year. 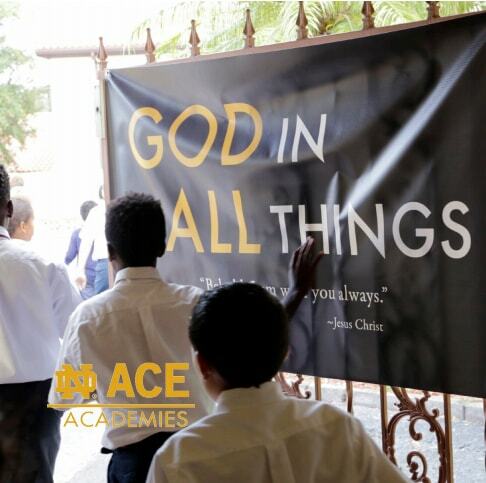 Notre Dame ACE Academies leaders and teachers are committed to continuous professional and spiritual growth. Teacher Leader Formation: Notre Dame faculty annually provide 50+ hours of responsive professional formation to each teacher. Collegial Visits: Dozens of teachers and leaders across the network participate in field trips to learn from each other and other high-performing schools throughout the year. Faith Formation: Annual retreats for teachers and leaders reignite zeal for our shared purpose of making God known, loved, and served.